Jenny Montague, assistant curator of marine mammals at the New England Aquarium, with Baranov. “I want us to work as a team,’’ she says of her relationship with the animals. If Jenny Montague was ever on the old “What’s My Line?’’ TV quiz show, she could have told questioners that she used tons of fish in her job, but was not a chef. That she worked with a playful, intelligent group. And that a little bribery goes a long way. With those clues, would the panel have figured out that she is assistant curator of marine mammals at the New England Aquarium? 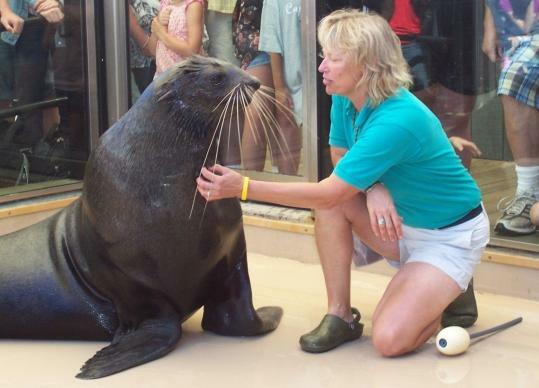 A large part of Montague’s job is training sea lions, harbor and fur seals, sea otters, dolphins, and porpoises. Right out of high school in her native California, she began working in a marine park and has more than 25 years of experience with the animals. On Tuesday she will give a lecture and demonstration on marine mammal history and training techniques at the Aquarium, 1 Central Wharf. The 7 p.m. lecture in the Harborside Learning Lab is free to the public. Q. How do you learn to train marine animals? A. Almost all of it is on the job. We follow all the same principles you find in psychology. It’s the same type of behavior modification used on humans. Q. Do you mean bribery? A. To an extent, yes. We say positive reinforcement. We also try to make the seals participate with us and be interested in what we’re doing. I had this one sea lion who basically said, that’s it, I’m not going to play anymore if you keep giving me that fish. I found he participated anyway because he was interested in what we were doing. Q. But the fish are great bait for them, right? A. With the fish, they may get one, they may get 10, they may get 15. They’re never really sure. That’s what keeps them interested. It’s like hitting the jackpot. Q. Do you have a favorite animal? A. I probably shouldn’t, but right now, my favorite is Ursula the fur seal. Ursula really enjoys figuring it all out on her own. We were able to train her to bow in 10 minutes. Q. There must be times when you get frustrated. A. If they don’t understand what I’m doing, it’s not their fault. We [trainers] will have a meeting and come up with a great training plan, and then we go out there and it’s pretty obvious that the seal wasn’t at the meeting, the information isn’t registering. But that’s a big part of the fun for me as a trainer, too. I don’t want to work with robots. I don’t want to be dominant over the seal. I want us to work as a team. I think a lot of us are better with our animals than with our families or co-workers. We give animals the benefit of the doubt. We’re definitely a lot more patient. Q. In your demonstration on Tuesday, you’re going to talk about Hoover, the Aquarium’s legendary talking seal, and play some recordings. Did he really talk? A. He really did and everybody, myself included, was flabbergasted. He would speak in a real deep, Tom Waits kind of voice and with a New England accent. He’d say, “Hoovah, get over heah, get outta heah.’’ He’d laugh this lecherous old laugh. His grandson, Chacoda, is here, and he’s been jabbering since he was a newborn. Q. Do you love your job? A. I’m a very lucky person. This is something I wanted to do since I was very small. I remember seeing a killer whale jump out of the water on a Jacques Cousteau special when I was 5 years old and that was it.